I am the mighty Himalayas". - The Bhagavad Gita, Tenth Discourse; Shloka 2.5. "The Himalaya is a great devatatma, a great spiritual presence, stretching from the west to the eastern sea like a measuring rod to gauge the world's greatness." The creativity of this genius was that he was able to see it as a single unity this overwhelmingly powerful image of the mighty Himalayan range. A very beautiful and charming description of the Himalayas is contained in the Kumarasambhava, which describes the snow-clad mountain range as the treasure house of innumerable precious stones, minerals, important herbs, trees, plants, creepers with delightful flowers; as the abode of the Siddhas, ascetics, Yakshas, Kinnaras, Kiratas and various types of animals and birds; as the source of the Ganga and several other rivers. Even the mention of mountains in India brings the word Himalaya immediately to the mind. The Himalayan range as a whole is sacred because it is in the north, which for Hindus is the direction of wisdom and spiritual rebirth. It also includes the highest peaks in the world, which are a sight to inspire awe and wonder in people of any race or creed. Even Mount Olympus in Greek mythology would pale in front of the reverence shown to the Himalayas in the Hindu stories. Neither is Mount Fuji as significant to the Japanese as the Himalayas to Hindus. From times immemorial, the Himalayas have given out speechless invitations to sages, anchorites, yogis, artists, philosophers et al. The western Himalayas teems with esteemed pilgrimages so much so that the entire Kumayun range can be called Tapobhumi or land of spiritual practices. Where else apart from Kailash and Manas-sarovar in the Himalayas could an all-abnegating Shiva roam with his bull? "The Himalaya is a great devatatma, a great spiritual presence, stretching from the west to the eastern sea like a measuring rod to gauge the world's greatness." - wrote Kalidasa, Ancient Indian poet. 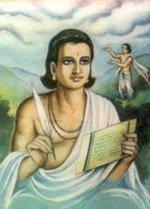 For more on Kalidasa, refer to chapter on Sanskrit. Western man's dominion over the Earth? when the British scaled earth's highest peak, the exploit was widely hailed as the "conquest of the Mt Everest." It was not realized and is often not realized still, that the word "conquest" was totally out of place in the context of the peak which is considered an object of reverence by many. One does not "conquer" nature. Nature humors at times, man's curiosity. Conquest is, therefore, an irreverent word." From the Himalayas has originated so many life-giving perennial rivers that have sustained such a rich civilization. Of these the Ganga is the most respected one. Shankaracharya (788-820), who propounded the Mayavad doctrine, referred to the holy river as the goddess of divine essence, and established one of the four cardinal hermitages in the Garhwal Himalayas. Scientist J C Bose (1858-1937), also ventured into the Himalayas, as expounded in his sagely philosophical essay Bhagirathir Utsha Sandhane, to explore how the Ganga flows down from the "matted locks of Shiva". Apart from being a natural heritage, the Himalayas is a spiritual heritage for the Hindus. The most visited places of pilgrimage in India are located in the Himalayas. Prominent among them are the Nath troika of Amarnath, Kedarnath and Badrinath. There are also three seminal Sikh pilgrimage spots in the Uttarakhand Himalayas. All sages and prophets have found the Himalayas best for spiritual pursuits. Swami Vivekananda founded his Mayavati Ashram 50 km from Almora. The Mughul emperor Jehangir said about Kashmir, the westernmost extent of the Himalayas: "If there is a paradise on earth, it's here". As the loftiest mountains on Earth, the Himalayas have come to embody the highest ideals and aspirations. The sight of their sublime peaks, soaring high and clean above the dusty, congested plains of India, has for centuries inspired visions of transcendent splendor and spiritual liberation. "In the space of a hundred ages of the Gods, I could not describe to you the glories of Himachal; that Himachal where Siva dwells and where the Ganga falls like the tendril of a lotus from the foot of Vishnu. There are no other mountains like Himachal, for there are found Mount Kailas and Lake Manasarovar. As the dew is dried up by the morning sun, so are the sins of mankind by the sight of Himachal." The Himalayas are sacred for followers of five Asian religions--Hinduism, Buddhism, Jainism, Sikhism and the indigenous Bon tradition of Tibet. These religions revere the mountains as places of power where many of their most important sages and teachers have attained the heights of spiritual realization. Himalayas are often refered to as devatma or God-souled. Giri-raj or the King of Mountains, as the Himalayas is often called, is also a deity by itself in the Hindu pantheon. Hindus view the Himalayas as supremely sacred, as a corollary to seeing god in every atom of the universe. The mighty altitude of the Himalayas is a constant remembrance to the loftiness of the human soul, its vastness. a prototype for the universality of human consciousness. Mt Everest being the highest spot on earth has been truly recognised as the crowing glory of the Himalayas. 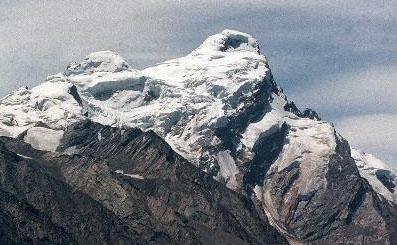 It is the mother goddess for Sherpas, who worship it as Chomolungma while the Nepalese call it Sagarmatha. Hindus, by far the largest group in India with more than 800 million adherents, regard the entire range as the God Himalaya, father of Parvati, the wife of Siva. King of the mountains, Himalaya lives high on a peak with his queen, the Goddess Mena, in a palace ablaze with gold, attended by divine guardians, maidens, scent-eating creatures and other magical beings. His name, composed of the words hima and alaya, means in the Sanskrit language of ancient India the "abode of snow." As a reservoir of frozen water, the body and home of the God Himalaya is the divine source of sacred rivers, such as the Ganga and Indus, that sustain life on the hot and dusty plains of northern India. (source: The Himalayas in Indian Art – By E B Havell v. 4, 6 and Kalidasa: His Art and Culture - By Ram Gopal p. 119 - 129). For centuries, the mountains, the Himalaya and the Vindhya, and the rivers Ganga, Yamuna, Sindhu, Krishna, Mahanadi and Cauvery, have been the cradles of India's civilisation. They have given it the mosaic of its diversity and provided its deep, enduring spiritual strands. Of these again, the Himalaya has, over millennia, commanded a special reverence. It is the abode of the gods, home to the great pilgrim centres of Amarnath, Kedar, Badrinath, Mount Kailash and Manas Sarovar. It has been a forbidding barrier deterring invaders through the ages and, in its snow-capped heights, abiding reminders of Nature's majesty. Ganga, Yamuna, Sindhu and that other great river of northern India, Brahmaputra, emerge from its folds. The sensitive return from its slopes chastened and humbled, aware of the forces that-far more powerful than them-control the elements. (source: Himalayas - By Hiranmay Karlekar - dailypioneer.com - August 5 2004). "India has stupendous mountains and quiet, village dotted plains. Her rivers sweep majestically on the plains and sing silver songs among the hills. The Himalayas form a great northern battlement with an average height of about 18,000 feet. (source: The Spirit of India - By W. J. Grant London published by B. T. Batsford Ltd. 1933 preface and p. 11-13). (source: Our Heritage and Its Significance - By Shripad Rama Sharma p. 15-16). The ancient poets and sages regarded the range as more than a realm of snow; they saw it as an earthly paradise sparkling with streams and forests set beneath beautiful peaks. Above and beyond the earthly paradise of the Himalayas lie the heights of heaven. In the Hindu imagination, Kashmir is said to be the abode of gods. Amid these deeply forested hills, Siva is said to have narrated to his consort Parvati, the sacred Amarkatha, the secret of immortality. In ancient times, Kashmir was known as Sarada Peeth, the seat of the goddess of learning. (source: Philosophical and architectural marvels of Kashmir valley - By Benoy K Behl). 1. Mount Kailash: One peak in the Himalayan region stands out above all others as the ultimate sacred mountain for more than half-a-billion people in India, Tibet, Nepal and Bhutan. Hidden behind the main range of the Himalayas at a high point of the Tibetan Plateau northwest of Nepal, Mount Kailas rises in isolated splendor near the sources of four major rivers of the Indian subcontinent--the Indus, Brahmaputra, Sutlej and Karnali. Hindus also regard Kailash as the place where the divine form of the Ganga, the holiest river of all, cascades from heaven to first touch the Earth and course invisibly through the locks of Siva's hair before spewing forth from a glacier 140 miles to the west. At only 22,028 feet, Kailash is thousands of feet lower than Everest and other Himalayan peaks. Yet its extraordinary setting and appearance more than make up for its modest height. Kailash retains its grandeur when viewed from a distance. More than any other peak in the Himalayas, it opens the mind to the cosmos around it, evoking a sense of infinite space that makes one aware of a vaster universe encompassing the limited world of ordinary experience. It has served as an inspiration for numerous Hindu temples and shrines in the distant plains of India. The sight of the peak has a powerful effect, bringing tears to the eyes of many who behold it, leaving them convinced that they have glimpsed the abode of the Gods beyond the round of life and death. Neither Hindus, Buddhists, nor any Tibetans would ever contemplate trying to climb Kailash. Hindus view Kailash as the divine dwelling place of God Siva and Goddess Parvati. There, as the Supreme Yogi, naked and smeared with ashes, His matted hair coiled on top of His head, He sits on a tiger skin, steeped in the indescribable bliss of meditation. From His position of aloof splendor on the summit, His third eye blazing with supernatural power and awareness, the lord of the mountain calmly surveys the joys and sorrows, the triumphs and tragedies, the entire play of illusion that make up life in the world below. The power of His meditation destroys the world of illusions that bind people to the painful cycle of death and rebirth. When He rises to dance, He takes on the functions of Brahma and Vishnu and creates and preserves the universe itself. Why it is called Everest is given in a book "Science and the Raj: 1857-1905" by Deepak Kumar. George Everest was Surveyor General of India from 1830-43. However, in 1852 an Indian named Radhanath Sikdar was one of the first to compute that that peak XV was the highest point on Earth. When Radhanath told Colonel Waugh, the new SGI, Waugh immediately named it Everest after his predecessor and benefactor even though the peak had local names like Sagarmatha. According to Kumar the Nepalese names were Devadungha and Gaurishankar and the Tibetan name Jamokangkar. The Royal Geographical Society approved of the name Everest but the Royal Asiatic Society repudiated it. Later S. G. Burrard, another SGI, admitted that "when the Gaurishankar controversy opened, the name Everest was an interloper on the map of Asia". Of course, the racist British, keen to play down the scientific capabilities of Indians, did not mention that it was Raghanath Sikdar in Calcutta who had first realized the importance of peak XV. 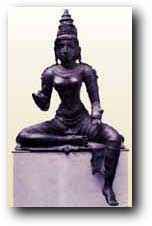 In addition to the paradise She shares with Siva on Kailas, Parvati has her abode on a number of other mountains. As Nanda Devi, the "Goddess of Bliss," She dwells in beauty on the lovely peak of that name in the Himalayas northeast of Delhi. The highest mountain in India outside the principality of Sikkim, Nanda Devi soars in alluring curves of rock and ice to culminate in a delicate summit, poised at 25,645 feet above a ring of snow peaks that form a sanctuary protecting the Goddess from all but Her most determined admirers. The only break in their otherwise impregnable wall of rock and snow is the terrifying gorge of the Rishi Ganga, one of the sources of the sacred Ganga, named after seven sages of Hindu stories, who fled the oppression of demons to seek refuge with the Goddess before departing this world to become enshrined as seven stars in the constellation of Ursa Major. Shepherds and porters from nearby villages who venture into the area believe that they can sometimes hear the sounds of these sages--drums beating, the blare of trumpets and the eerie barking of dogs. The few foreign mountaineers who manage to penetrate the gorge, inching their way along the sides of sheer cliffs that plunge thousands of feet into the river roaring below, find themselves in a paradise of gentle meadows filled with flowers at the foot of the sacred peak, which stands like a temple in the middle of the sanctuary itself. Nanda Devi lies in Uttarakhand, the principal area of pilgrimage in the Indian Himalayas. This region ranks second only to Kailash and Manasarovar in the degree of its sanctity for Hindus. Closer to the lowlands and much more accessible, it is visited by many more pilgrims, who come by the tens of thousands to bathe at Gomukh, the glacial source of the Ganga, and to worship at Kedarnath and Badrinath, lofty temples of Siva and Vishnu sequestered in narrow valleys beneath the icy thrones of the Gods themselves. The region is also the favorite haunt of holy men and wandering yogis, who come to follow the example of Siva and meditate in the sharp clear air of the heights, within sight of the peaks that lead to heaven and the goal they seek. 3. Annapurna and Machapuchare: Goddess Parvati dwells in yet another form on sacred Annapurna One, named like Nanda Devi for the deity said to reside on its summit. A range of peaks that includes Gangapurna, Machapuchare and Annapurnas One through Four, Annapurna rises in one long sweep above the lush green hills of central Nepal. Seen from the tropical valley of Pokhara in the twilight before dawn, the range's peaks appear to float like bluish-gray icebergs on a sea of liquid shadows. Etched with shadowed flutings, the corrugated face of Annapurna One--the highest summit at 26,545-feet--becomes a golden backdrop to the slender pointed peak of Machapuchare, the "Fish's Tail." Annapurna means in Sanskrit "She who is filled with food." Unlike Nanda Devi, who can take on the wrathful form of Durga, Annapurna is regarded as a purely benevolent deity. A kindhearted Goddess of plenty, She is the Queen of Banaras, the holy city of the Hindus on the banks of the Ganga south of Nepal. Each year, after the autumn harvest, the people of Banaras celebrate a festival dedicated to Her called Annakuta, the "Food Mountain," in which they fill Her temple with a mountain of food--rice, lentils, and sweets of all kinds to be distributed to those who come to receive Her blessings. 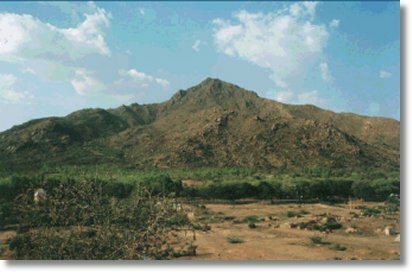 One of the best place to see how mountains are venerated is far to the south, where Arunachala juts out of the Tamil plain, a hundred miles from Chennai. At the foot of Arunachala is the ashram of Ramana Maharshi, one of the greatest spiritual masters of this century. Though he died in 1950, Ramana's ashram today is one of the most potent spiritual places in India, drawing people from all over the world. The only writing Ramana ever did consisted of devotional poems to the mountain. Arunchala, he was to say later, is the physical embodiment of Shiva, of God Himself. Why go anywhere else? According to Shiv Purana, Brahma and Vishnu emerged from Shiva, the Unmanifest Source of all. No sooner had they come into form than they began to argue about which of them had the superior role, as the creator, and the protector of the universe. To stop their quarrelling, Shiva manifested as a column of light so radiant that both Brahma and Vishnu were temporarily blinded, and had to stop their bickering.